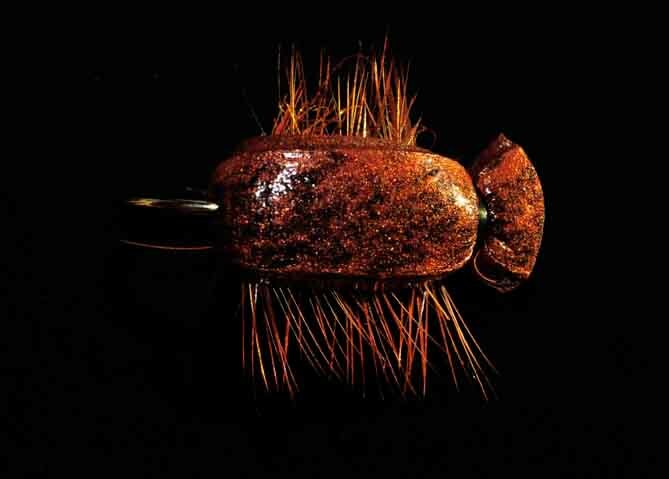 Fly fishing for South African indigenous Yellowfish species on fly fishing tackle, is truly up there with the best at least. These Yellowfish species are worth their weight in gold in all aspects. Catfish Joe is unique in our style of fishing in South Africa in that we designed rafts ‘ala Alaska’ drift boat method to fish for the two largest scale bearing fish in South Africa's most remote waters . Largemouth yellowfish (Labeobarbus kimberleyensis) of up to 30 pounds and Smallmouth yellowfish (Labeobarbus aeneus) of 16 pounds are the sizes you can hook into with us. We fish only in waters that allow for the best backdrops to be able to make your trip an unforgettable experience. There are 6 yellowfish species to choose from in our product basket, all in unique surroundings. 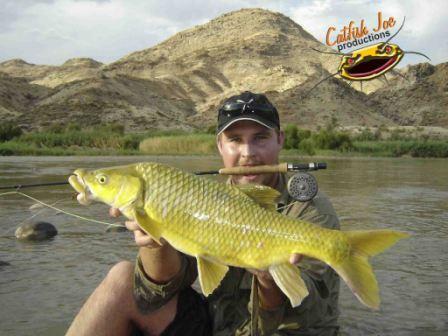 “Catfish Joe Productions” was the first sponsor of the first yellowfish telemetry research in South Africa and is dedicated to the yellowfish conservation. If its gold you’re after ,..yellowfish is your species. Many anglers don’t know the difference between the large and the smallmouth before and when they are around 300 mm especially beginners to the sport of fly fishing. 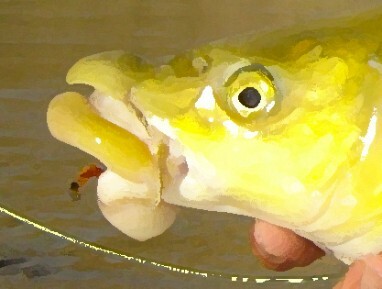 More so as some smallmouth yellowfish don’t have the very thick lips that most possess. They have two pairs of barbells though and eyes that are able to see below and to the sides. They occur higher than the largemouth yellowfish in smaller tributaries. They prefer clear flowing water of bigger rivers with sandy rocky bottoms. The Smallmouth (barbus aeneus) breeds in spring to early summer after the first good rains of the season. It is said that they migrate upstream to spawn on suitable gravel beds. 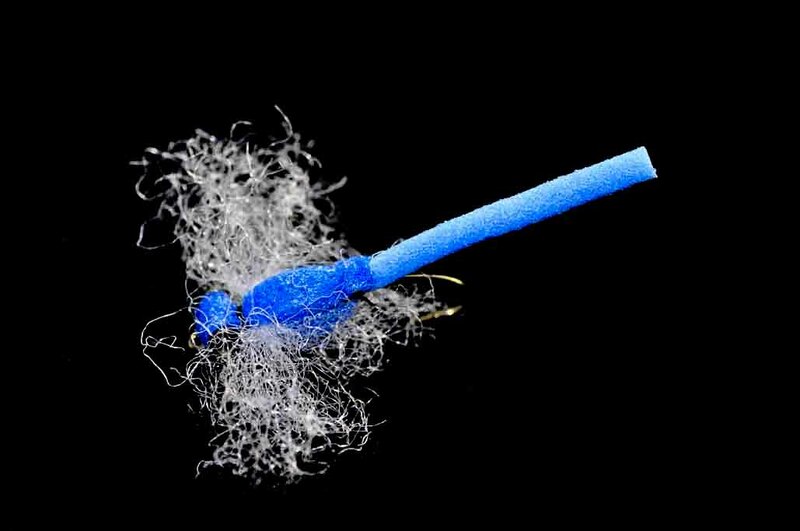 Eggs hatch in 3-8 days and after a further 5 days begin feeding on microscopic organisms. 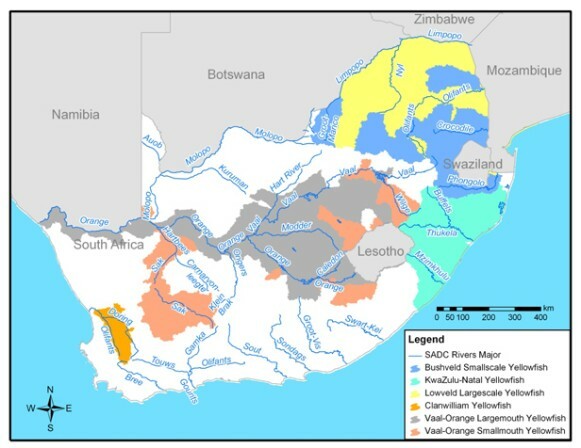 The Vaal /Orange catchment is the major area but is also found in Gouritz, Kei, Fish, Limpopo and Zimbabwe and other areas. They mature at 200 mm. Females at 240 mm. They are omnivorous but gets more piscivorous when large. The Vaal River and Orange River have many great spots to catch them in large numbers. Our largest during October this year in the beginning of the season was a 12 pound fish by Hardus in the Lower Orange river where we operate our wilderness raft excursions. We expect very large specimens during our November excursions. The heavy floods of the beginning of this year 2010 have now cleared sand and silt over gravel beds and there should be more spawning areas than the 10 previous years .Already I have witnessed exceptional spawning by Mudfish along the Orange river. What is important is to remember the preferred habitat and to “match the hatch” . Also bear in mind that they prefer fast flowing water of around 1-1 ½ meters between interspersed rocks with some aquatic vegetation along the edges. Between large rocks and behind drop offs. See our video on “How to catch Yellowfish volume 1-5”.Or buy our DVD on Yellowfish. 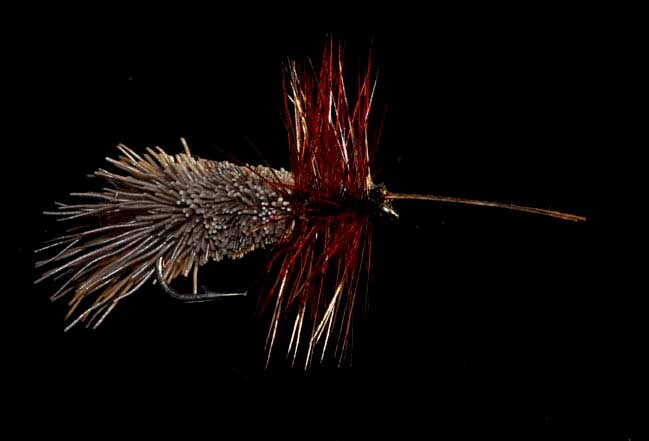 5/6 weight rod, floating line and tippet of 2-6 kilograms depending on the size of the fish and the ease of catch periods. I go for the large smallmouths and prefer the 6-9 weight rods as I don’t want to lose the largemouths that also from time to time take my large flies while catching for Smallmouths. Never go lighter than a 5/6 to minimise break offs. Dragon fly nymphs, wide range of caddis patterns, daddy long legs, TVN, stonefly nymphs, beetles, adult dragonflies etc. See fly section. I have Nothing to say about the fight than that it is a few times harder than any trout. It is a very powerful fish and when catching a 4 kilogrammer in the stream it sometimes feels like you have hooked into a rock or got stuck. 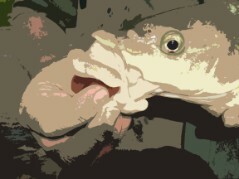 It then takes a few seconds to determine whether you have hooked into a fish or whether you got stuck. No feeling in the world can beat a good day’s smallmouth yellowfish action in a wide long rapid. Even better to do it where there’s no other people around in perfect surroundings. And even better if you sleep right next to the water and do some night casting in bright moonlight as well. That’s in summer when the water is warm and they are prolific in the fast water. 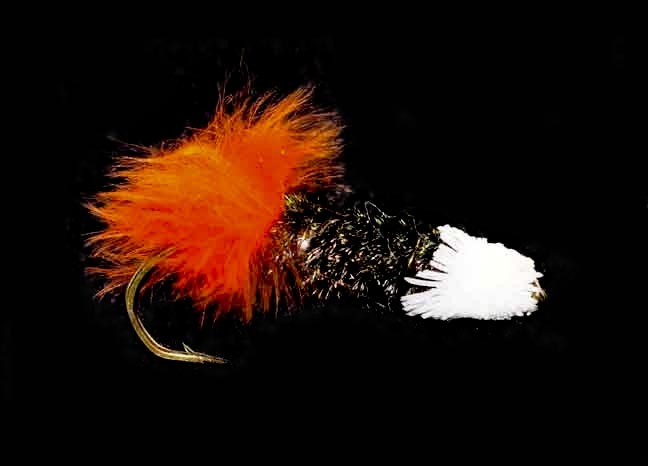 In winter it gets extremely tricky and very small flies with very slow actions will produce a fish ..or maybe two during June / July. Not really the time to target them. Just after the spawn is good . SA record I believe is 7.84 kilograms on conventional tackle. Large fish on fly as far as I’m concerned are over 4 kilos with everything over 5 kilos exceptional catches. From “Catchment to Coast” and the promotion of angling for indigenous species "Tourist and Eco-Facility Planning and Development"
Every tourism effort should take into consideration the amount of impact the development would have on the environment or biodiversity. Without great effort and a little self study it is within the capacity of every person to consider the environment. The Biodiversity act and all other acts should be read and understood by every citizen of the country. Unfortunately there are large amounts of fishermen and businessmen that place the conservation of our biodiversity below the desires to catch easy fish and/or to make easy money. Yellowfish species are important as far as resource is concerned as they have definite economic and social benefits especially as far as tourism is concerned. 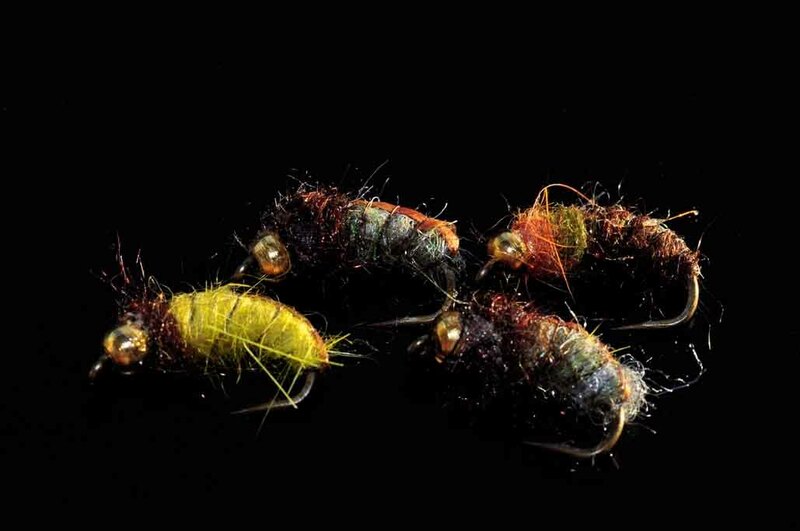 They have enormous monetary value and a indicator species for other aquatic ecosystem health. As a matter of fact the potential monetary benefits of yellowfish by far outweigh those of trout and other species on fly rod. Linda Nel on Smallmouth yellow telemetry bi-monthly findings. ERYCA Smallscale yellow in need of conservation. Andre Hoffmann- basics on approaching the Vaal at “Wag n Bietjie”. 1-Development and management of indigenous tourist facilities. 2-Awarenes campaigns to all levels regarding the value of indigenous fish . 3-Conservation programs to all levels regarding indigenous fish and biodiversity. 4-Sponsorship of scientific programs on Yellowfish. 5-Filming of important behaviours of yellowfish. 7-Photographic support of yellowfish awareness. 8-Lobying of important issues through multi media. 9-Support of scientific comments regarding preservation of indigenous fishing or fish species. 11-School /educational programs for learners. 12-Multi media support to learners. 13-Promoting yellowfish through guiding on remote rivers amongst others.